Earlier this year I spent an evening photographing Mesa Arch, the famous and oft-pictured natural stone arch at the precipice of Canyonlands National Park. I photographed Mesa Arch at sunrise twice previously — quite fortunately alone both times — but that was years ago before the explosion of photography interest on the internet. Based on the many reports I have read during the intervening years of elbow-to-elbow photographers and workshops going postal at sunrise when the sun lights the underside of the arch, I had essentially given up on ever photographing Mesa Arch again. In 2011 I decided to try for an image I have wanted to make there for some time and which might allow me to enjoy the arch in solitude again — the Milky Way arcing over Mesa Arch. Photographer buddy Garry McCarthy and I have executed versions of this idea with other arches. It is surprisingly tough to do well, since lighting must be consistent across the many frames that are blended to make the final image. The result must be flawless with no blending artifacts if one wishes to print the image for display. 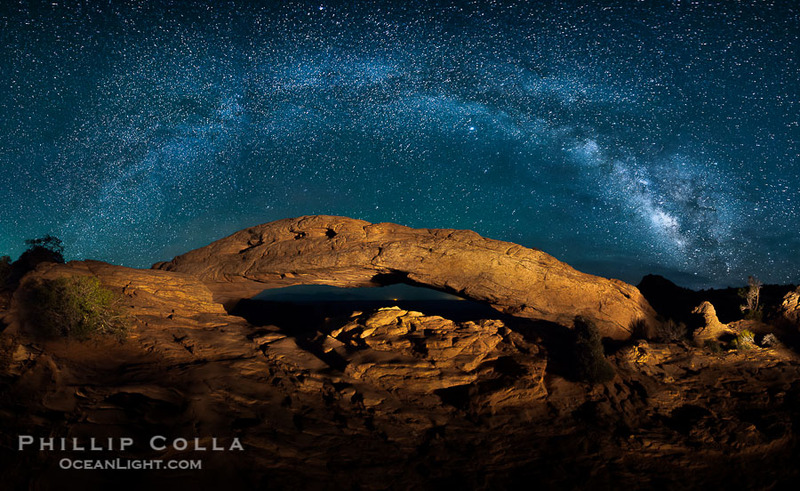 Using hard-earned uber-secret lighting and processing techniques from past night photography efforts, combined with several different compositions and attempts at lighting the arch in various ways, I ultimately decided upon this highly detailed 50″ x 80″ panoramic photo of Mesa Arch as the final result of my efforts. If you like this image, please see my website devoted to my full collection of Landscape Astrophotography images.